Safety planning is a complex, dynamic and collaborative child protection process that focuses on building enough safety for children to remain within the care of their families. The safety planning process involves professionals working collaboratively with parents, children and an informed family network to develop and implement a detailed safety plan that leaves everyone confident that the children will be safe in the parents’ care in the future. The safety planning process also involves monitoring and reviewing the safety plan over time so that everyone is satisfied that the safety plan is working and will continue to work to provide ongoing safety for the children. Because of the complexity and dynamic nature of the safety planning process, there is no specific formula or model that you can follow. Just as every family has their own unique qualities, strengths and challenges, so every safety planning journey may be a little (or a lot) different. There are however, key steps that need to be included in the safety planning process and a number of tools and processes that are helpful. This document explores those key steps and attempts to provide a rough guide as to how these steps fit together. The steps have been written in a linear fashion but they are usually not linear in action and you may find that you are working on a number of steps at the same time and moving back and for between different steps. There are also a number of key principles that underlie the safety planning process, which are outlined after this step-by-step guide. For the family and their safety and support network to be meaningfully involved in the safety planning process, they must first be involved in a comprehensive and balanced assessment that focuses on what is happening in the family and what needs to happen in the future to ensure the safety and wellbeing of the children. The more that the family and their safety and support network are involved in the assessment process, the more likely it is that the family will be able to participate in safety planning and that the detailed safety plan will be achievable and relevant to the family. 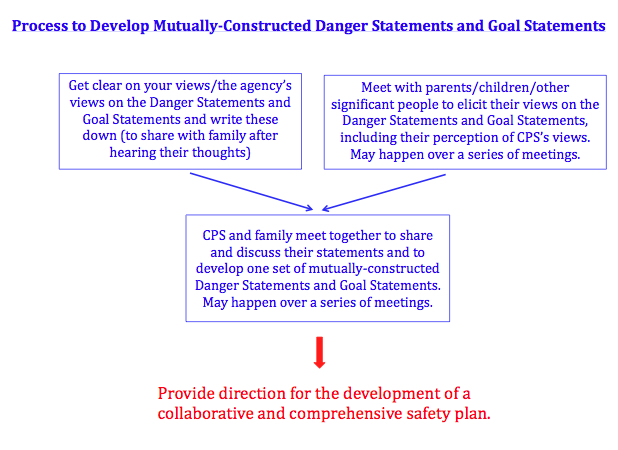 An essential first step in the safety planning process is the development of mutually-constructed danger statements (that describe the dangers or worries for the children that need to be addressed by the safety plan) and mutually-constructed goal statements (that describe what needs to be in place for everyone to be confident that the children will be safe in the future). These danger statements and goal statements provide focus and direction for the safety planning process. For families to meaningfully participate in the creation of a detailed safety plan, they need to have participated in the development of the danger statements and goal statements that provide this direction to the safety planning process. Clarify and record your views/the agency’s views on the danger statements and goal statements, based on what you know at this point. Use a questioning approach with the parents/children/family to elicit and record their views on the danger statements and goal statements, and to then ask them to reflect on the views of the agency (this creates a foundation that makes it easier for people to then hear the views of the agency). You can use a number of tools to assist you in this questioning approach: The Family Roadmap, the PFS framework, the Future House, the Safety House, or the Three Houses tool. Use a questioning approach with the parents/children/family (and one or more of the above tools if that is appropriate) to share the danger statements and goal statements that you wrote earlier. Use a questioning approach with the parents/children/family to reflect on everyone’s views and to develop one set of mutually-constructed danger statements and goal statements that can be used in working together to build future safety for the children. While the danger statements and goal statements are developed collaboratively with the family, this doesn’t mean that everyone has to agree on all of the danger statements or goal statements. What is important is that everyone can understand each other’s views and can recognise that addressing the danger statements and achieving the goals is the purpose of the child protection intervention. Constructing mutual danger statements and goal statements may involve using the family’s language or adding worries or goals that are important to the family, but does NOT involve diluting the concerns or the safety and wellbeing focus. As described above, moving from professionally-created danger statements and goal statements to mutually-constructed statements is a process and may take some time. Subsequent steps in the safety planning process may proceed as you continue working toward mutually-constructed danger statements and goal statements. Assess whether there are dangers or worries that place the children at risk of signficant harm in the immediate or short term and is so, work with the parents, children and any other extended family or safety/support network people to create an immediate safety plan to address the imminent dangers. This immediate safety plan may include arrangements such as a safe person moving in, one of the parents moving out, or the children going to stay with other family members. Include details of how long this immediate/short term safety plan will be in place for and how the immediate/short term safety plan will be monitored and reviewed. Make sure everyone has a copy of the safety plan. If there are dangers that place the child at risk of significant harm and none of the above arrangements are available or able to provide sufficient safety, then it may be necessary for the child to be removed from the family’s care and placed in out-of-home care (and then hopefully returned to the parents’ care as quickly as possible as a result of the safety planning process). 3. Ensure the child and parents/caretakers understand the reason for CPS intervention, what is happening now and what the safety planning process will involve. An essential next step in the safety planning process is ensuring that the child and parents/caretakers understand the reason for the child protection services’ intervention, what is happening now (for example, the child being removed from their parents’ care or the development of an immediate safety plan), and what is going to happen next in the safety planning process. Even with the best of intentions, our child protection processes (particularly when they involve the removal of a child or the threat of removal of a child) can be shocking and potentially traumatising for children and parents, so a clear and simple explanation is essential to help mitigate any unintended harm or trauma from our interventions. Research shows that a shocking event doesn’t have to be traumatising if you are able to understand what is going on and you are able to receive comfort from someone who understands. The ‘Immediate Story’ provides a clear and immediate explanation to children (and parents/caretakers) that helps to minimise the traumatic impact of CPS intervention. The story also provides an immediate explanation to parents, foster carers and family members so that they are able to reinforce this explanation and provide informed comfort and support to the child. The ‘Immediate Story’ also provides parents, children, safety and support network members and other professionals (including carers) with an overview of the safety planning process and initial information about the most important non-negotiables of the safety planning process (such as the need for a safety and support network, that safety needs to be demonstrated, and that everyone will need to work together to develop a comprehensive safety plan that leaves everyone confident that the child will be safe in the parents’ care in the future). While more detailed information about the safety planning process will need to be provided over time (when people are not as distressed and are able to process more detailed information), it is important to provide at least an overview of the safety planning process at this point so that children and parents are able to hold on to some hope that it will be possible for the child to return to the parents’ care or for the family to live together again. The ‘Immediate Story’ connects the past, present and future in a way that helps people to retain a sense of hope about the future and not become stuck in the pain of the present or the past. 4. If the child is not in the parents’ care, establish regular and safe visits for the child with the parents/ significant family members. When a child is removed from the care of their parents and placed in out of home care, establishing safe and meaningful contact between the children and their family is one of the most critical and immediate issues that the child protection agency must deal with, and it is usually one of the first issues that children and parents want to focus on. Establishing visits for the child with their parents (and other significant family members) so that the child can receive comfort from their attachment figures, needs to happen as quickly as possible to minimise any additional trauma for the child. The child’s primary attachments with his or her parents (or signficant caretakers) also need to be upheld for the child to be able to develop healthy attachments with other caretakers and in future relationships. Collaborative planning toward safe contact is an important step in the safety planning process and the ‘Safe Contact’ tool has been developed to support collaborative, transparent and safety-centred decision-making about contact. The ‘Safe Contact’ tool is designed to be used when children are first placed in out of home care, or as quickly as possible after placement. If workers are able to engage the family and their networks in meaningful and safety-focused conversations about contact/visitation and are able to demonstrate collaborative and transparent decision-making about contact/visitation, this can begin to build trust and establish a collaborative working relationship with the family that is necessary for effective safety planning. The safe contact tool can also be used with foster carers and kinship carers to involve them in the development of safety plans for contact/visitation. Creating opportunities for foster and kinship carers to participate in this way can assist them to have a greater understanding of the concerns, an increased commitment to the contact safety plans and more of an understanding of and willingness to participate in the development of the long term safety plan. The involvement of foster carers also helps to connect the past and present within the child’s mind, which assists with the child’s healing. As collaboratively planning with the family and the safety and support network progresses toward reunification, decisions need to be made about when and how contact visits can be increased (for example, to unsupervised visits, overnight stays, etc). The ‘Safe Contact’ tool can be used to ensure that these decisions involve all the significant people, including the children where possible, and that everyone is able to understand how these decisions are made. Contact visits are also an opportunity for the parents to demonstrate the actions of protection and behavioural change that is required as part of the safety planning process, and the ‘Safe Contact’ tool can also assist in making this process explicit with the family and the network. Working with the parents and children (and other family members) to identify and involve people in a safety and support network for the family is an essential step in the safety planning process. The safety and support network is made up of people who will support the parents to develop and maintain a safety plan for the children and who will hopefully continue to provide this support long after professionals have stopped working with the family. A strong and active safety and support network provides professionals with confidence that the parents have the support they need to follow the safety plan and to continue using the safety plan for as long as the children are vulnerable to the identified concerns or dangers within the family. The safety and support network provides support to the parents and safety for the children (and in some situations, safety from future allegations for the adult whose behaviour we are worried about). The “Circles of Safety and Support” tool is a visual tool that can help identify people for the family’s safety and support network and help professionals and family members have conversations about the role of the safety and support network and how to assess who can be part of the network. The safety and support network need to be fully aware of the concerns, be willing to participate in the development of the safety plan (from whatever point they join the network) and be willing to support the family in upholding the child’s on-going safety and maintaining the safety plan over the long term. There need to be enough people in the safety and support network to support the parents in upholding the safety plan and to carry out the different arrangements listed in the safety plan. In general, the more serious the concerns and the more vulnerable the child, the more people you will need in the safety and support network. The availability of each of the people in the safety and support network is also a factor in determining how many people need to be in the network. For children to be able to understand and meaningfully participate in the safety planning process and to begin the process of healing from the abuse or neglect that they have experienced, children need to be provided with a clear explanation about what happened in the past and what is happening now. This detailed explanation also helps to minimise any additional unintended trauma from our child protection interventions. Developed in the UK by Susie Essex, John Gumbleton and Colin Luger (as part of the Resolutions Approach to working with ‘denied’ child abuse), the ‘Words and Pictures’ method provides a developmentally appropriate process and explanation to help children understand what has happened in their family that has led to the current situation (ie. the child being in out-of-home care or child protection professionals being involved with their family). The ‘Words and Pictures’ explanation is developed collaboratively with the parents (whenever possible), as it is an explanation from the child’s significant attachment figures that is most powerful for the child. The ‘Words and Pictures’ explanation can build on the ‘Immediate Story’, helping everyone move from a brief story that was told by the child protection agency to a more detailed story that includes the family’s voice. While the ‘Words and Pictures’ process is explicitly focused on meeting the child’s needs for an explanation, it also engages the parents in a therapeutic process. The ‘Words and Pictures’ explanation provides parents with the opportunity to create some sense of order within their memories (which can promote healing) and to better understand their own experiences and the experiences of their child. The ‘Words and Pictures’ method also provides a foundation for the later ‘Trauma Healing Story’ (see point 10). 7. Ensure the safety and support network understand the reason for CPS involvement and what the safety planning process will involve. A bottom line in safety planning is that people in the safety and support network need to understand the reason for child protection services’ involvement with the family so that they are able to meaningfully participate in the safety planning process. This doesn’t mean that the safety and support network need to agree with the views held by child protection services (and possibly others), but they do need to understand the concerns and to know that these are the concerns that the safety plan must address, over time, for child protection services to be confident that the children will be safe in the parents’ care. The parents can take responsibility for talking this information through with all the potential members of the safety and support network prior to the first network meeting. If this happens, it is important that child protection services go over this information at the meeting to make sure that everyone is clear about the danger statements and goal statements. A copy of the assessment framework (that includes the danger statements and goal statements) can be provided to all the potential members of the safety and support network prior to the first network meeting (with the parents’ permission) and this can be discussed/explored further at the meeting. The ‘Words and Pictures’ explanation that has been prepared for the children can be presented to the safety and support network at or prior to the first network meeting. Often the safety and support network will begin to be involved in the safety planning process before the ‘Words and Pictures’ explanation has been completed and if this is the case, the danger statements and goal statements can be shared at the beginning of the network involvement and then the ‘Words and Pictures’ explanation can be shared once it has been completed. The safety and support network also need to understand the safety planning process and their role within the process, so that they are able to make an informed decision about whether this is a commitment that they are prepared and able to make. The role of the safety and support network needs to be explained to each person as they are invited to join the network, and this can then be reinforced at the initial network meeting (or at the beginning of each meeting as new members join). Once all the previous steps have been worked through, the safety planning process then involves the family, their identified safety and support network and the professionals working together to come up with a detailed set of safety rules or guidelines that describe the practical, day-to-day arrangements that will be put in place to make sure the children are safe in the future in relation to the identified dangers or worries. To be able to meaningfully contribute their ideas within these large safety planning meetings, family members (and particularly parents and children) will often need to be given the opportunity to reflect beforehand on what needs to be included in the detailed safety plan. Large meetings can be very stressful and it may be difficult for parents and children/young people to think clearly and creatively within this context. There are a number of tools and processes that can be used with individuals or small groups before the larger safety planning meetings to assist family members to reflect on and talk about their ideas for what needs to be included in the safety plan. The Family Roadmap process is a visual process that can help parents (and other family members) to think through what they are already doing, and what else they need to be doing, to achieve the goals. The Future House is a simpler version of the Family Roadmap and may be more appropriate for some families. The Safety House is a simple and visual tool that has been designed to help children think about and talk about what they think needs to be included in the safety plan. Some of these tools and processes may have already been used with parents and children (for example, in the process of creating the mutually-constructed danger statements and goal statements) and so these ideas can be revisited as you start to move toward the creation of the detailed safety plan. It is also important to build on what is already in place to create safety (for example, an immediate safety plan or a safety plan for contact visits) so that the detailed long-term safety plan builds on what is already working. Bringing everyone’s views together to create the detailed safety plan usually involves everyone meeting together over a number of safety planning meetings and as described above, may first need to involve one or two initial meetings just with the parents and with the children or young people. Bringing everyone together in these safety planning meetings to share their ideas and agree upon what needs to be included in the detailed safety plan is a complex process and requires someone (usually the caseworker) to step into the role of facilitator. A number of tips for facilitating safety planning meetings can be downloaded from my website. I have also developed a Safety Planning Framework that can assist in facilitating these complex and often contentious discussions about what needs to be included in the detailed safety plan. The Safety Planning Framework provides a structure and focus for the safety planning meetings, helping everyone to contribute their ideas and to work forward from the danger statements and goal statements toward the development of the detailed safety plan. The Safety Planning Framework contains one page per goal statement and enables everyone to think through what everyone is already doing and what else needs to be included in the safety plan to achieve this particular goal (including any bottom lines for the child protection agency). It is common to work through one goal statement per safety planning meeting. The safety planning process also requires everyone to consider how the safety plan will be monitored and reviewed over time, who will be involved in updating the plan as the family’s circumstances change, and what will happen when problems or safety concerns arise. The Safety Planning Framework includes sections for each of these issues to make sure that they are part of the discussions and to ensure that arrangements for each of these issues are included in the final safety plan. Once the detailed safety plan has been developed and everyone is satisfied that the plan is solid enough to provide ongoing safety for the children, the safety rules or guidelines need to be written in language that the children can understand. Once this has been done, the safety plan is then presented to the children and they do pictures to the safety plan to show that they understand each of the rules. The Safety Planning Framework includes sections that involve the family and network in writing the safety rules in language that will make sense to their children, and in thinking through how the safety plan will be presented to the children. Once safety has been established through the safety plan and the involvement of the safety network, a more explicit focus on trauma healing for the child can then begin. Trauma treatment for many children involved in the child protection system is critical, to help children heal from past abuse or neglect and be able to experience themselves as safe in the future. Even with a comprehensive safety plan that mitigates any further abuse or neglect, a child who continues to suffer the effects of past trauma (even if they appear to have no memory of the trauma) may not be able to distinguish between what is safe and what is not safe, and may experience future situations as dangerous and threatening long after the actual danger has been addressed. For example, a child with untreated traumatic memories of domestic violence may panic in the future whenever their mother and father raise their voices, when he or she hears loud noises during the night or when they witness an argument or fight at school. Without trauma treatment, the fear and stress that the child will experience when they are retriggered will be the same as if the abuse was continuing. Until the safety plan is in place, it is usually not possible for the child to experience enough safety (either physically or emotionally) to process and heal from their earlier traumatic memories. Only once there is a safety plan that stabilises the situation for the child and has engaged the parents and safety network in making the changes necessary to create future safety for the child, can trauma healing commence. For the child to be able to participate in trauma healing (once safety has been established), the child needs to hear that they are not responsible for the ‘bad’ or worrying things that have happened. The child also needs to receive permission (therapeutic safety) from their parents or significant attachment figure to talk about and to process any traumatic memories that they have. Arianne Struik has developed a ‘Trauma Healing Story’, which assists everyone to think through the importance of the child receiving trauma treatment and establishes the important preconditions for trauma treatment. The ‘Trauma Healing Story’ builds on the detailed ‘Words and Pictures’ explanation and is developed collaboratively with the parents (or other significant attachment figures) to provide the child with a clear message that the child is not responsible for the abuse or harm that has happened, as well as providing the child with permission (therapeutic safety) from the parents/attachment figure to talk about and to process any traumatic memories. What this means in terms of the safety planning process is that once the safety goals have been addressed within the safety plan, then the healing and wellbeing goals can be focused on. It is important that the healing and trauma treatment aspect of the safety planning process has been talked about from the start, so that the family and network don’t expect that the work with the agency or other professionals will cease once the safety plan is in place. The trauma treatment work will normally be undertaken with a therapist, so it is important that the therapist is involved in the safety planning work as early as possible, or at a minimum, is provided with a copy of the ‘Immediate Story’, ‘Words and Pictures’ and detailed safety plan so that they can begin the work of creating the ‘Trauma Healing Story’ and then proceed with trauma treatment. It is possible that the child’s behaviour will worsen as they undergo trauma treatment and so this needs to be acknowledged and planned for within the safety plan. Parents may need support to understand and be able to support the child through the healing process, and parents may themselves need to undergo trauma treatment. If the parents own trauma is preventing them from making the changes that they need to make to create safety for the child, then their trauma treatment will need to happen as part of the safety planning process to establish safety (before the child’s trauma healing can commence). For some families, particularly where the parents have acknowledged the abuse or neglect that their child has experienced and take responsibility for their actions in either causing this harm or not acting to protect the child, the trauma healing work may be able to commence earlier. Arianne’s six tests within the “Don’t Let Sleeping Dogs Lie” method provide guidance and a structure to assess when trauma treatment can commence. Review how the safety plan is going on an ongoing basis. Meet regularly with the children, the parents and the safety and support network to explore everyone’s views on how the safety plan is working and whether there are any concerns or problems. Write down specific examples of what’s going well and work with everyone to refine and strengthen the safety plan to address any concerns. A tool to assist with the collaborative monitoring and reviewing of the safety plan can be downloaded from my website. If trauma treatment for the child is part of the safety planning process, then the trauma healing work can be underway while the safety plan is being monitored and reviewed. 11. Hand the management of the safety plan over to the family and the network. When everyone (parents, children, professionals and safety network) are confident that the safety plan is working, that the trauma treatment has provided enough healing for the child (and the parents if necessary) and that it is safe for child protection services to withdraw, then monitoring of the safety plan can be handed over to the child’s safety and support network. The safety plan needs to contain information about what the family and the safety and support network will do if there are future worries or if the network is not able to continue working with the family, so this needs to be fully explored prior to child protection services closing the case. Child protection agencies have enormous power to intervene in the lives of families and in the parent-child relationship. While this statutory power needs to be exercised if a parent is unable or fails to protect their child from preventable and significant harm, I believe that child protection agencies have a responsibility to ensure that this power is exercised in ways that are respectful and preserve the dignity and wellbeing of family members. Safety planning processes are designed to foster inclusiveness and collaborative decision-making, so that the strength, capacity and wellbeing of parents and families is enhanced rather than undermined by the involvement of child protection agencies. The expression “Nothing about us, without us” captures this commitment to ensuring that any planning about the family is done with the family. An essential principle in safety planning is the inclusion and strengthening of the family’s safety and support network. The role of the safety and support network (made up of family members, friends, other professionals or people who regularly see the child) is to uphold the safety of the child and to support the parents in making the necessary changes to build and maintain future safety for the child. The safety and support network need to be fully aware of the concerns, be willing to participate in the development of the safety plan (from whatever point they join the network) and be willing to support the family in upholding the child’s on-going safety and maintaining the safety plan over the long term. 3. Safety planning involves facilitating a change process. The safety planning process is a change process, which invites family members, safety and support network members and child protection professionals to meet together to identify the dangers for the children and to work out realistic and meaningful solutions to address these dangers. Safety planning is all about helping people to make the shifts that are required in a change process: understanding the need for change, visioning a different future and acknowledging that real change requires changes in their own thoughts, attitudes and behaviours. 4. The journey needs direction! Effective Safety Planning is built on thorough and collaborative risk assessment. To develop a comprehensive and rigorous safety plan, the safety planning process needs to begin with everyone being clear about the dangers to the children that need to be addressed (expressed as danger or risk statements) and what the family needs to do in terms of their care of the children for everyone to be confident that the children will be safe in the future (expressed as safety goals). These danger statements and safety goals provide focus and direction for the development of the safety plan. 5. Agreement about future safety is a bottom line, not agreement about the past. It is very common in child protection work for there to be disagreement between family members and professionals about whether or not the children were harmed and who was responsible for causing the harm. Trying to force agreement about what happened in the past will usually lead to a breakdown in communication and get in the way of building working relationships. Family members and professionals do not need to agree about the past to be able to work together to build future safety. What is necessary is that family members and the safety network understand the professionals’ position and are prepared to work with professionals to show everyone that nothing like this will happen in the future. Focusing on future safety in this way creates the possibility of working together to build future safety, even when there is little agreement about the past. 6. Involve the children in every part of the safety planning process. Children need to be offered opportunities for meaningful participation in every part of the safety planning process. While there is a growing awareness within the child protection field about the importance of listening to the voice of the child, meaningful participation for children requires more than just eliciting the child’s voice about what is happening in their family and their world. The United Nations Convention on the Rights of the Child (specifically Article 12) establishes children’s rights to be heard and to participate in planning and decision-making about issues that affect them. • Given full information about what is happening at each step of the process. • Given full opportunity to have his or her voice heard. • Provided with clear information about the possible consequences of speaking up. • Empowered to share decision-making with adults. • Understand why child protection services are involved with their family. • Understand the child protection processes that their family will be involved with. • Be given the opportunity for their voice to be heard. • Be provided with clear and developmentally appropriate information about the possible consequences of them speaking up. • Be given the opportunity to participate in planning and decision-making in safe and developmentally appropriate ways. • Be supported and helped to understand what is happening at each stage of the safety planning process. 7. Safety Planning is a journey not a product. The long term safety plan may require the family to arrange their daily lives in ways that are very different to their previous living arrangements. These changes cannot be put in place all at once. An effective safety plan requires time to be developed, refined and demonstrated. At a minimum, it usually takes two – three months to develop and refine a collaborative and effective safety plan. The safety plan is developed over time as the family work with the professionals and the safety and support network to work out the safety rules or guidelines that the family will put into place to show everyone that the children are safe and the alleged perpetrator is protected from any further allegations. The child protection worker must be involved in regular monitoring and follow-up with the children and all the adults involved in developing and implementing the safety plan, and everyone needs to be involved in the process of reviewing and refining the safety plan. In this way the family and professionals are implementing the definition of safety as strengths demonstrated as protection over time. 8. Ensure immediate safety for the children at each stage of the process. At each stage of the safety planning process, you need to make sure there is immediate safety for the children. Arrangements need to be put into place to make sure that the children are safe in the short and medium term (for example: tonight, this weekend, for the next few weeks, for the next few months) while everyone is working together to develop a safety plan that will ensure the long-term safety of the children. Depending on the concerns, these immediate or short term safety plans might involve things such as: A safe adult moving into the family home and taking responsibility for the care of the children; the adult we are worried about moving out of the house and not having unsupervised contact with the children; the children being placed in day care and/or or being monitored each day by professionals/safe adults (for example, in neglect cases). In some instances, the only way of ensuring immediate safety may be to place the children in the care of other safe adults (foster carers or relatives). For children and parents who have experienced past trauma, long-term safety and wellbeing may only be possible once they have had the opportunity to heal from the impacts of the trauma. A child, young person or adult may have participated in the safety planning process, but if they continue to be traumatised (even if they appear to have no memory of the trauma), they may not be able to distinguish between what is safe and what is not safe, and may experience future situations as dangerous and threatening long after the actual danger has been addressed. Without trauma treatment, such a person can be triggered into a state of hyper-arousal (or even hypo-arousal) by situations that may remind them of the traumatic experience. For example, a child with untreated traumatic memories of domestic violence may panic in the future whenever their mother and father raise their voices, when he or she hears loud noises during the night or when they witness an argument or fight at school. This triggering of traumatic memories can leave people in a state where they are chronically stressed and alert to danger. So while the actual physical or emotional danger may have been alleviated by the safety planning process, if the child (or parent) continues to be traumatised, they may not experience themselves as safe and may therefore still be experiencing the same level of fear, defensiveness and confusion they would feel if the danger was still present. So once the safety planning process has successfully addressed the dangers, trauma treatment and healing will frequently be necessary for the children – and at times for the parents. Talking about the importance of trauma treatment as part of the safety planning process will help everyone to recognise and plan for healing and recovery. 10. Distinguishing between hope and trust. The safety planning process is designed to provide parents and families with the best possible opportunity to demonstrate that they are able to make and sustain the necessary changes (to keep their children safe). This opportunity is provided within a context of respectful and hopeful practice, but bringing a sense of hope to a situation is very different from working from a place of naïve trust. Safety planning is not about trusting that parents, family members and safety network members will do what they say they will do. Trust can lead to naïve practice and to the children being left in dangerous situations. At all stages of the safety planning process, safety needs to be demonstrated. This means that while you can acknowledge and honour the statements that people make about what they will do in the future, these statements only translate into safety once actions or behaviours have been demonstrated over sufficient time to enable everyone to be confident that these actions will be continued. The monitoring process (regularly visiting and checking that people are doing what they say they will do) is critical as this clearly communicates to the family and the safety network that the changes in behaviour have to be demonstrated, as well as providing a mechanism to build confidence that the safety plan is actually working. Struik, A (2014). Treating Chronically Traumatized Children: Don’t Let Sleeping Dogs Lie!”. Routledge.